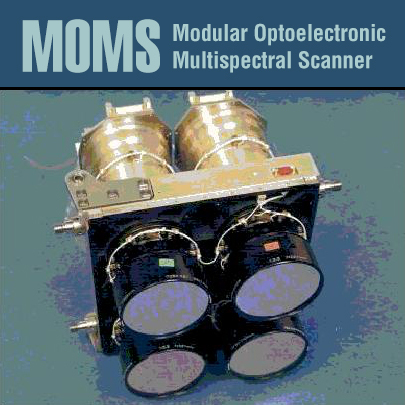 The Modular Optoelectronic Multispectral Scanner (MOMS) is a scanning system (based on CCD technique) for airborne and predominantly spaceborne geoscientific remote sensing application. The first version MOMS-01 (with a dual channel mode: 600 nm and 900 nm) has been developed by order of the German Minister for Research and Technology under contract from the German Aerospace Research Establishment (DLR, previous DFVLR)by Messerschmitt-Boelkow-Blohm (MBB). Scientific guidance for the experiment has been provided by the University of Munich/FRG. Most important characteristic of MOMS is the modular arrangement of the CCD-sensor, electronics, optical lens system and filters that allow the instrument to be adapted for completely different geoscientific tasks or missions, as well as the refurbishment of the system between missions as demonstrated in practise. The multispectral mode of the MOMS family envisages geoscientific data application for: general geologic mapping, mineral resources exploration, hydrology; mapping and monitoring of renewable resources (agriculture, forestry, urban and regional planning); coastal zone monitoring; topographic mapping with conventional methods. The first two flights of the space qualified MOMS-01 took place on board of Space Shuttle with the missions STS-7 in June 1983 (total recording time: 26 min) and STS-11 in February 1984 (total recording time: 30 min). The sensor was placed with magtape recording unit (HDDT) on the SPAS-01 platform, built by MBB, which was loosely connected to the Shuttle by a specific bus system for system control. Both flights yielded high-resolution images with 20x20 m ground pixel size from about 300 km orbital altitude. Data takes are available over Africa/Arabia, Australia, East Asia, India, South America, South East Asia, and USA. Data processing, archiving of products and their distribution to users is made by the German Remote Data Center (DFD) in Oberpfaffenhofen, FRG. Data products include CCT copies (1600,6250 bpi), film negatives and B/W paper copies (scale1:800000) and appropriate image enlargements. Catalog material is available on microfiche.